When there is spinal infection, a common question from the referrer will be ” Is it TB? “. 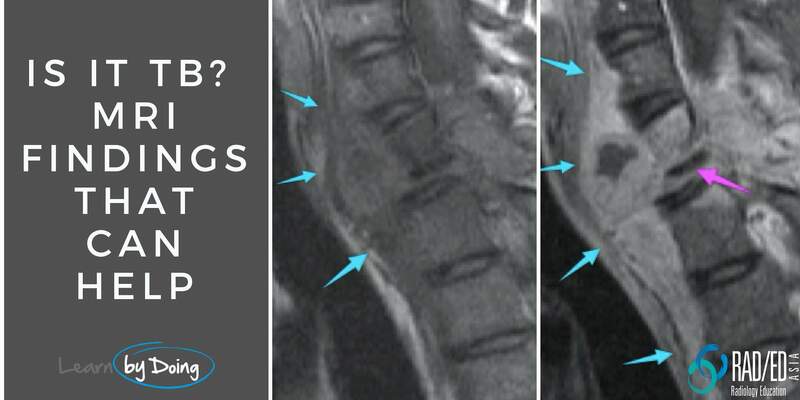 It can be difficult to tell as MRI findings in spinal TB can look exactly like bacterial spondylodiscitis but there are some findings on MRI that are very suggestive of TB. 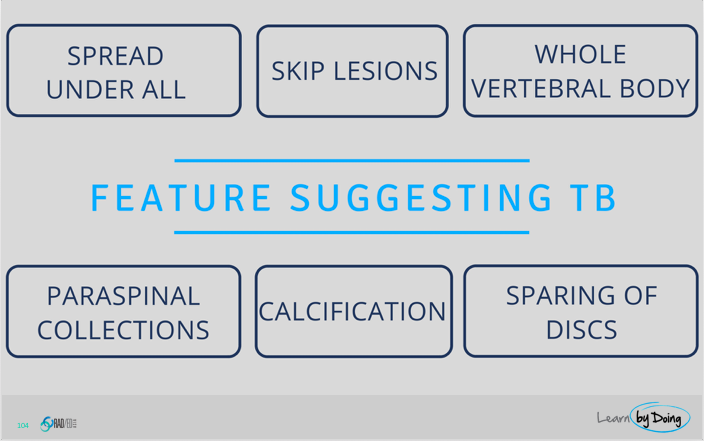 So what are the more suggestive changes of spinal TB on MRI? 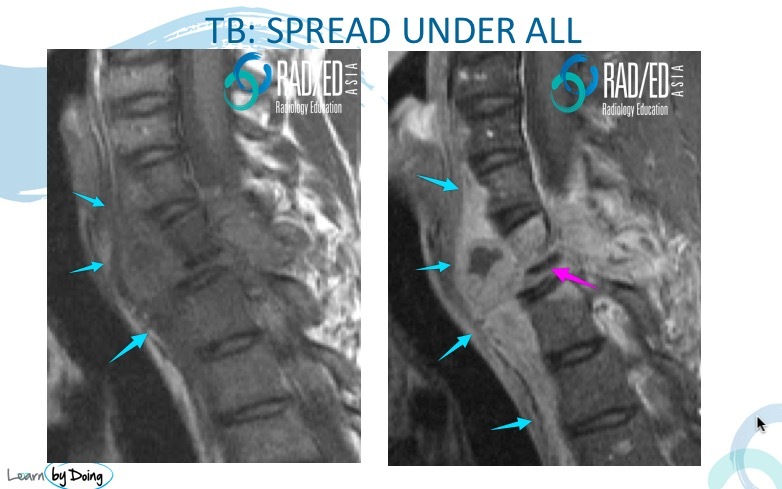 SPREAD UNDER THE ANTERIOR LONGITUDINAL LIGAMENT: TB often begins in the anterior vertebral body so TB has a tendency to spread underneath the ALL more so than in the anterior epidural space. 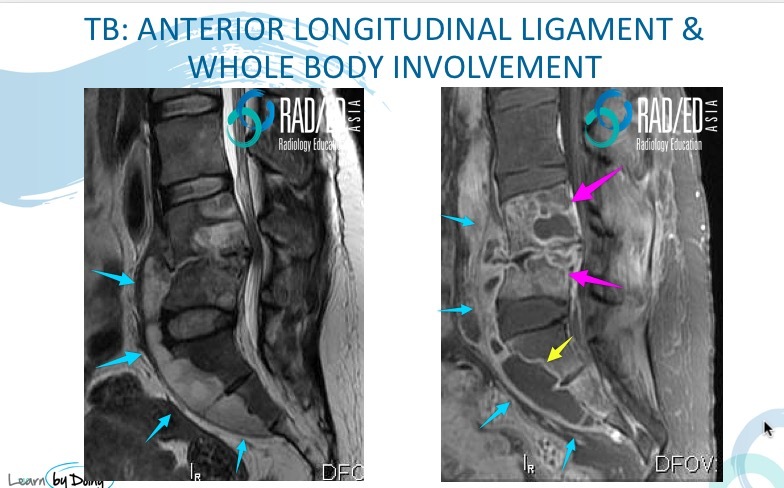 It can track underneath the ALL and extend well away from the vertebral body/ disc it has arisen in. Image Above: Blue arrows outline the ALL with phlegmon and an abscess tracking along the undersurface of the ALL. Vertebral body destruction pink arrow. In TB there is a tendency for the whole vertebral body to be involved. Skip lesions ( multifocal areas of discitis/ osteomyelitis with normal vertebral bodies and discs in between) can occur either to direct spread from infection tracking under the ALL ( see image below) or as separate regions of vertebral body involvement. Absence of Disc Involvement: In bacterial spondylodiscitis, disc involvement is the norm. In TB the disc can be spared, with only involvement of the vertebral body. Image Above: Blue arrows outline the ALL with underlying abscess tracking along the under surface of the ALL. Vertebral whole body involvement (pink arrow). Infectious erosion of the anterior margin of S1 and S2 ( yellow arrow) by the abscess deep to the ALL. Image above: Whole body involvement in mid thoracic spine ( Blue arrows) with sparing of disc in between ( pink arrow) . 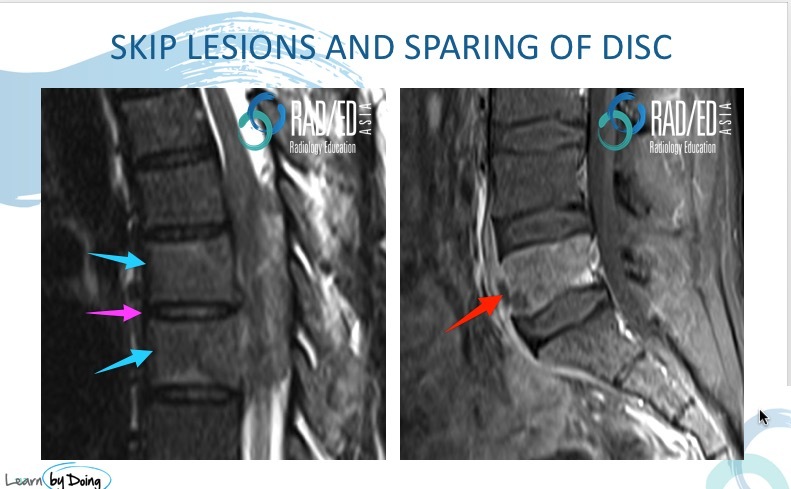 Image on left same patient skip lesion with involvement of L5 body ( red arrow) but no disc involvement. Cord Ischaemia and Longitudinal Myelitis: A more rare complication of TB is developing cord ischaemia or a longitudinal myelitis. This is due to ischaemia/ infarction from arterial occlusion secondary to a vasculitis or ischaemia from venous compression/stasis and is seen as increased T2 signal in the cord. 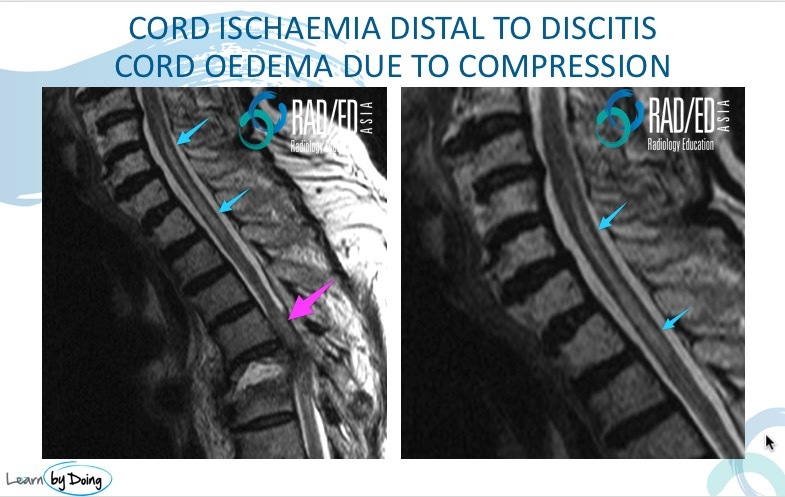 Image Above: Vertebral collapse and epidural infection result in cord compression with increased cord signal at this level ( pink arrow) which is secondary to cord compression. However separate, long area of increased cord signal in cervico thoracic region ( red arrow) with normal intervening cord, presumed secondary to cord ischaemia/ longitudinal myelitis.